Chrysalis Whisperer: How Do You Get to Carnegie Hall? Do I have to say it? Okay, okay, I'll say it. Practice. it makes absolutely no difference what people think of you." Here's hoping he was right. This year, I'm challenging myself to be consistent and post at least one blog entry per week. It’s January 2019. You know what that means. Tis the season of the almighty noble and lofty resolutions. Those of us (ever the optimists) who take time with goal-setting are busily hatching plans to make this the year. Some have already given up on going to the gym and will maybe get around to cancelling the membership in October, or will go on paying the fee in perpetuity because it’s too humiliating to quit and admit defeat to the smug receptionist with her bouncy ponytail and thigh gap, who will look at you and say, "Awwww." Others of us are busily making vision boards, cutting out inspirational words and images, gluing them to pieces of cardboard and hanging them somewhere to remind us of our best hopes and brightest dreams. Some of us will find within themselves the elusive GOYA factor* and meet with success. Others of us will opt for evening after evening on the sofa, binge-watching the latest show on Netflix, eating flaming hot cheetos, and washing it down with a nice Michelob Ultra, right out of the bottle. Still others will inevitably hang laundry on the Peloton and order pizza. I don’t know about you, but that sounds enticing to me. It’s why I’ve been digging into thinking about what I need to do in order to arrive at this type of an end to my time here on earth. We got a little fun and adventure in this year, traveling, hiking, and cycling in a fly-over state. We discovered lots of people who were anything but deplorable, which is good to know. I did finally finish turning that box of PVC bones into a functional skeleton. I improved my design on my deer-proof duck feeder. We went to THE Oktoberfest... I hear tell we missed the Clintons by a day. 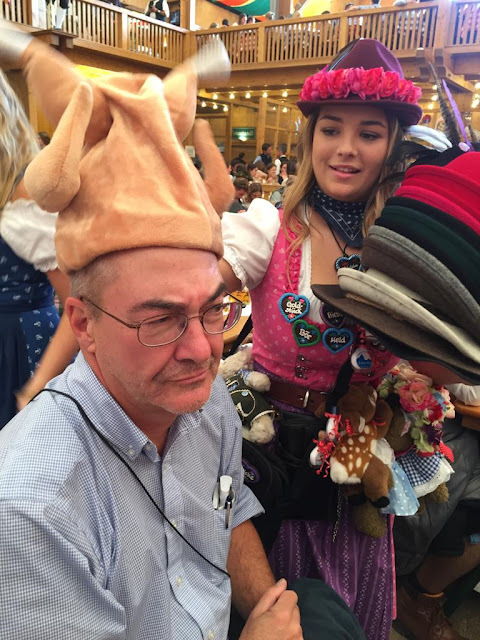 We tried on traditional costumes and drank beer at Oktoberfest. This year, I want to spend more time doing things like planting trees, reducing our plastic use, improving my writing skills, exercising more, eating better, and learning interesting things, and less time in a trauma trance. It has been nearly two years since I have written a blog entry. While it was something I wanted to do, I got to the point of where I got so overwhelmingly wrapped up in anxiety about being judged that I just gave up. So my new thing will be to please myself. Elizabeth Gilbert suggested that in her book on Big Magic. One of my other goals is to learn something new every day, so I may sometimes write about that. Today I learned about purposeful practice, and that if you want to get good at something, you need to be willing to do it repeatedly and purposefully. I learned that failing is part of the process. So if I write at least one blog entry a week, maybe I might improve as a writer. How does that story go about the monkeys in the room with typewriters? Maybe it won’t be Shakespeare. Most likely it won't be Shakespeare. Other evidence that practice leads to improvement can be found in any grade school band concert. Have you been to one of these things as an unattached adult? I know you love your kids and all, but JIMINY CHRISTMAS!! Alas, amid the cacophony, sour notes, and missed beats, there lurks the occasional dirt-stained impresario who will one day, years from now, and with hours of practice, astound with his/her/xis/zer musical brilliance at a Tuba concert at Pioneer Square. Beyond that, such concerts are best enjoyed with ear plugs. What else? Maybe sometimes I’ll write about life with my mom now that she has moved in, and what I'm learning that makes it all a heartwarming experience or an unfortunate tragicomedy. I know there's a book in this experience somewhere. There may be entries that will entertain. You could get lucky. We won't know until we get there. Let's hope you don't end up wanting to write me an angry screed about the four minutes and 27 seconds of your life that you will never get back again.